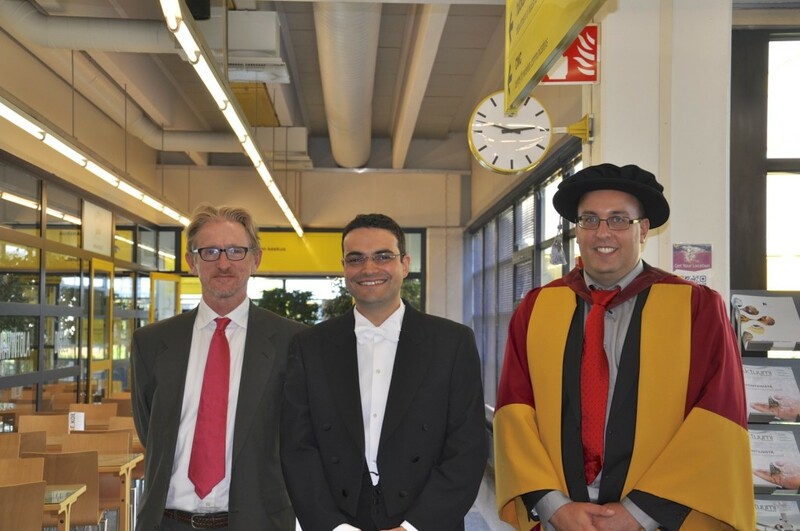 Home » News » Denzil Ferreira defends PhD! Congratulations to Denzil Ferreira who has just defended his PhD. His opponent was Andrew Campbell (Darthmouth College), and his pre-examiners Ceclia Mascolo (University of Cambridge) and Florian Michahelles (ETZ Zurich). Denzil’s thesis was entitled AWARE: A mobile context instrumentation middleware to collaboratively understand human behaviour. You can read more about his thesis in this post. Photo: Denzil (middle) is posing with Andrew Campbell (left) and Vassilis Kostakos (right).